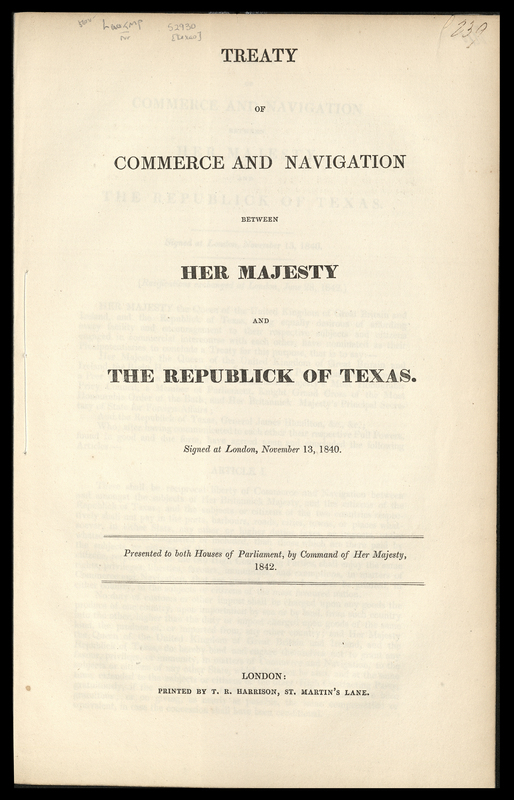 Treaty of Commerce and Navigation Between Her Majesty and the Republick of Texas. London: T.R. Harrison, 1842. This treaty of commerce and navigation between England and the young Republic of Texas, sometimes called a friendship treaty, is a rare and interesting piece of Texas and international history. In 1838, when Texas President Sam Houston sent diplomats to England and France to negotiate treaties recognizing Texas as a sovereign nation, the Republic was only two years old and was still skirmishing with Mexico over its boundaries. Houston sent J.P. Henderson to Paris and London in 1838, originally with the hopes of securing financial backing for Texas, as well as establishing diplomatic relations. In London, Henderson and Viscount Palmerston, then Prime Minister of the United Kingdom, drew up three treaties: one providing for British mediation in the Texas-Mexico hostilities, one calling for the suppression of the slave trade, and the one which Tarlton now holds, concerned with commerce and navigation. The United Kingdom never granted official recognition of Texas due to its own friendly relations with Mexico, but admitted Texas goods into British ports on their own terms. These treaties were signed in November 1840 but did not go into effect until July of 1842. As well as giving a window on this exciting moment in Texas history, this treaty provides insight into the surprising weight given to Friendship and Commerce treaties in the 19th century. The Republic of Texas, a sovereign nation for only twelve years, negotiated Friendship and Commerce treaties not just with the United States and England, but also with France, the Netherlands, and even with the Republic of Yucatan and the Hanseatic League. 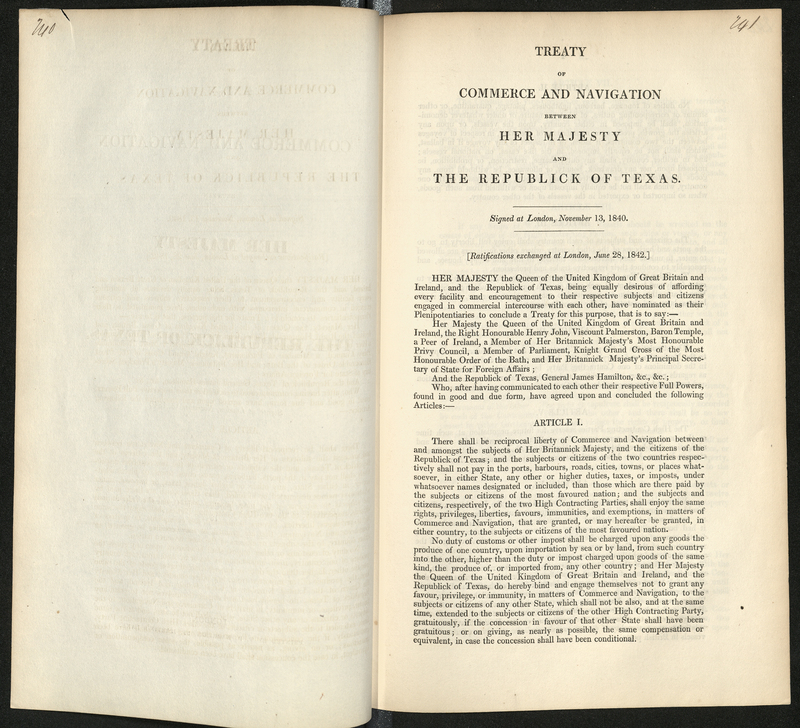 The Friendship and Commerce treaty played an important role in the early life of both the American and Texas republics; these agreements served to establish the nations' status as independent states and to secure economic and political support from more established international governments. The utility of the Friendship and Commerce treaty has declined in the 21st century due to several factors, not least among them the prevalence of multilateral agreements. Much can be learned about the new republic from the thousands of items printed between 1836 and 1846, from government documents to broadsides to histories as well as guides for potential emigrants and other narratives. For more details about the robust collection of Republic imprints held in Tarlton Law Library's Rare Books Collection, visit our exhibit, Legal Imprints of the Republic of Texas. 1 Adams, Ephraim Douglass. "Correspondence from the British Archives concerning Texas, 1837-1846," Southwestern Historical Quarterly 16: 3 (1913), pp. 291-327. 2 Streeter, Thomas W. "Bibliography of Texas: Texas Imprints 1839-1845," Vol. 1. Cambridge: Harvard University Press, 1955. Item 1417.